Mark Prosser, formerly of the esteemed Commonwealth Golf Club in Melbourne, has accepted a position with ADE Turf Equipment as the new Golf Territory Manager for Victoria. Mark started out in the turf industry with a position on the grounds staff at Royal Melbourne Golf Club in 1986, where he stayed for nine years before moving to Royal Adelaide in 1994. After only a year there, he was promoted to superintendent, a role which he excelled at during the Australian Open that was held there in 1998. Shortly after that tournament, Mark moved to Commonwealth where he remained until June of this year. Mark says he decided to make the move to ADE Turf Equipment because he wanted a career change for the last stage of his working life, but wanted to stay in the turf industry, which he is so passionate about. “When this role came up I was interested because I had heard it was going to be mainly golf, so I would still be able to catch up with superintendents I know and be able to pass on my knowledge of our range of equipment to them,” explains Mark. “I can go out there and build relationships and pass my knowledge on, because I tend to think I get on pretty well with most superintendents. Even though I am sitting on the other side of the fence now I know what they’re looking for and will hopefully be able to express the features of the mowers and products we’ve got. I think they’ll be a bit of banter going on from time to time,” laughs Mark. Tim Coram, ADE Turf Equipment’s Managing Director says he is “very excited to have Mark on board because of all his years of experience and the industry contacts he will bring to the role”. Mike Foskett the Regional Sales Manager in Australia & New Zealand for Ransomes Jacobsen shares Tim’s excitement. “Mark Prosser is a very well-respected industry professional, not only in Victoria but nationally as well. The appointment of Mark in this role is a commitment to growing our brand and customer service in Victoria. “He will be offering enhanced support to our growing customer base in Victoria and his appointment demonstrates that ADE and Jacobsen are investing in our customers and the industry. We welcome Mark to the Jacobsen team,” says Mike. 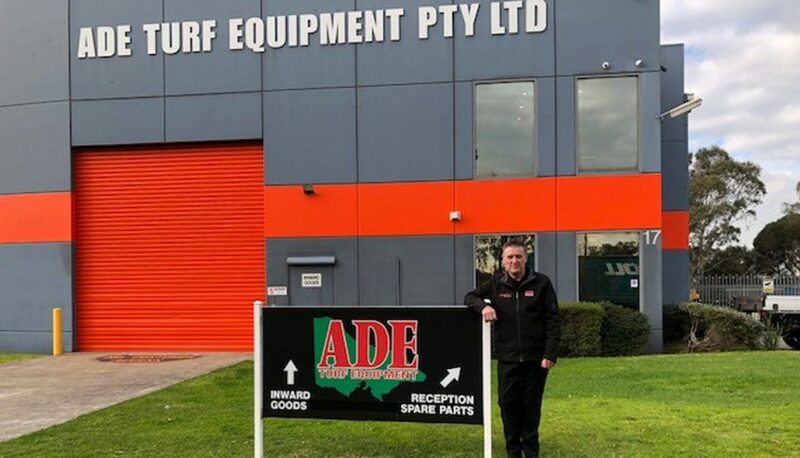 ADE Turf Equipment are premium suppliers of commercial mowers, golf and turf equipment across Victoria, specialising in Jacobsen Turf Machinery and Ferris Commercial Mowers. We wish Mark the best of luck with the new appointment and congratulations to ADE Turf Equipment.